Both Saturday and Sunday saw Boo charming fishermen. She was shown big fish, and the guy in the nice bass boat came in close so she could see his bait. 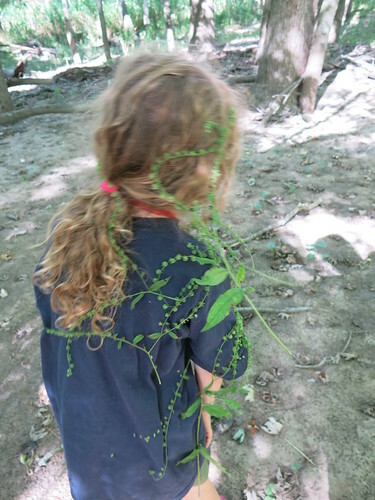 During our "explore", Boo walked through a burr bush. She must have gotten every single burr on that push in her shirt and hair. Poor kiddo. It was bad enough that I had her climb trees without a shirt on so I could pick burrs out better, and I reached my patience limit with her hair and Lee had to finish. The rest of the park we saw was fine, but around the campsite, the only plants were nettles and poison ivy. Turns out nettle flowers sting a whole lot worse than the rest of the plant. While setting up camp, we found a mostly dead "It's a Girl!" mylar balloon. I stomped on it to pop it as we were packing up, and it made a huge bang that echoed like a gun. I would not have been surprised to see a ranger come investigate it. We had a good weekend. Did you do anything fun?